From Anonymous of ISLIP, New York on 12/18/2017 . From petedebn4kids of Lake Villa , Illinois on 12/18/2017 . We have ordered from Hahn's for about 4 years and have NEVER been disappointed !! Their items are ALWAYS fresh and taste amazing. My kids LOVE the crumb cake and I could just eat the crumbs all day long. I have given them as gifts too and everyone LOVES them. Great job Hahn's :0) - 5 STARS !!! From Anonymous of Cooper City , Florida on 3/8/2017 . From Carolyn McGuire of Merrick, New York on 12/26/2016 . I ordered this product and gave them out as gifts to my coworkers. Always fresh and delicious, my coworkers were thrilled to have received a can of crumbs. I am sure I will be ordering them again in the near future. My son loves your crumb cake and loves crumbs even better. When we left his house, I asked him if he wanted any crumbs. He picked up the tin of crumbs and said that he wanted whatever was left in the can. From MARIA PRIETO of CAROLINA, Puerto Rico on 12/25/2016 . The gift was warmly welcomed. They loved the freshness, the exquisite taste and packaging. All o these facts and the fast delivery make you an excellent company. I have already recommended it to several friends. From Anonymous of New York, New York on 12/23/2016 . My office always receives several bucket of crumbs for the holidays. We all love them. They are delicious. Then we fight over who gets to keep the bucket. From Anonymous of North Potomac, Maryland on 12/19/2016 . From Rosemary Bailey of Stockholm, New Jersey on 12/8/2016 . From Anonymous of Media, Pennsylvania on 12/28/2015 . When we were young, my sister and I would sneak the crumbs off of the top of store-bought crumb cakes. A few years ago I bought a bucket of crumbs for her as a joke, and a reminder of our childhood. What a great idea to sell the crumbs! This year I bought a couple of cans for a gift swap event and saved a can for myself (the mini cans). They are delicious. My can is almost empty and so are the two that I gave away. Fun product. Thanks. From Juanita Rodgers of New Hyde Park, New York on 12/28/2015 . 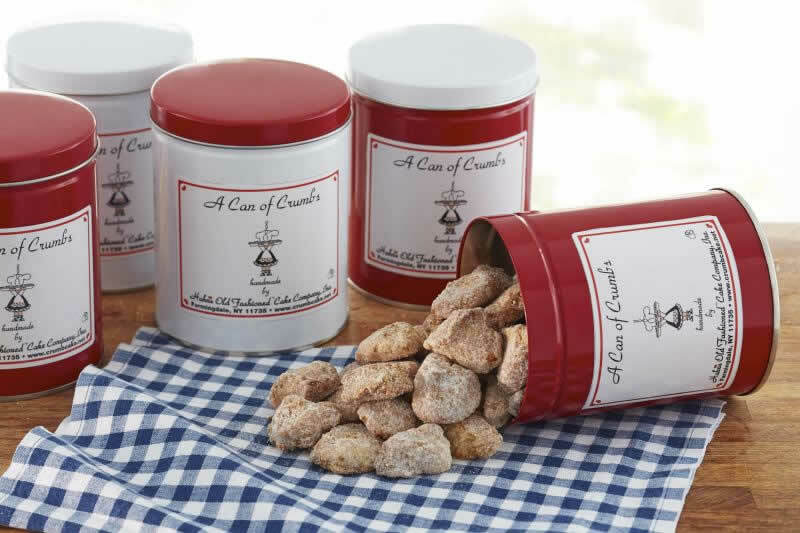 We just love the crumbs ... great for a quick pick-me-upper. From Debby Dunne of Lake Villa, Illinois on 12/15/2015 . I always buy the big bucket of crumbs. This year I decided to stuff my kids stockings with them so they can hide their can and not fight over who ate the crumbs :0) - what a great idea and an amazing product !! From Suzanne of KALISPELL, Montana on 12/10/2015 . You know when you like something but there's one thing about it that you especially like the best and you wish you could just have that one thing? This is it. The crumbs, oh the crumbs. I got my three cans two days ago and I've already finished off one can. They don't make crumbs like this in Montana. From JAKKI BRADDY of WYANDANCH, New York on 8/29/2015 . I used my bucket of crumbs to make French Vanilla Crumb Ice Cream w/ Caramel Dulce De Leche Swirl. Make the home made ice cream in an ice cream maker. Swirl in the dulce de leche caramel and 2 cups of crumbs. Let freeze and enjoy!!!! From kevin cush of altamont, New York on 6/17/2015 . From Dennis Morisette of Mokena, Illinois on 1/26/2015 . These crumbs are great treats. The three pack of cans is perfect for sharing with friends or just rationing your own indulgences. From Ken Cooke of Manorville, New York on 12/26/2014 . Would buy more from them!